Japanese semiconductor group Rohm, working with Osaka University researchers, has showed off a prototype chip it says can pump an impressive 1.5 Gbps down a wireless channel using carrier frequencies in the Terahertz range. The difficult very difficult Terahertz band – frequencies between 100 GHz and 10 THz – has been the focus of a frenzy of academic research. Faster than conventional wireless frequencies (but still below the visible light spectrum), successful deployment here would unblock the bottlenecks that now confront wireless development. Rohm says the key characteristics of its new chip are price and size. 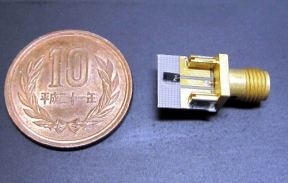 Current devices able to operate in the Terahertz range are relatively large (about 20 cm square, the company claims) and expensive (costing several million Yen). Rohm claims it can build the coin-sized chip for around $US1.30 while still beating current off-the-shelf Terahertz silicon speeds, which it says are limited to around 100 Mbps. As far as The Register can tell, most researchers slot future Terahertz kit as suitable only for indoor applications; and it’s likely that more exotic uses such as medical and biological imaging and sensor apps will dominate before any consumer “Terahertz wifi” kit appears. The frequencies between microwave and infrared are particularly attractive for medical imaging, because they are non-ionising, subject to far less scatter than visible or infrared wavelengths, and are good for imaging large bio-molecules. While Rohm says the chip could in future achieve 30 Gbps speeds, this is still far short of the wireless speed records achieved in research labs, which have surpassed the terabits/second mark over the last few years.